So, I have to be honest, not all of my intentions are exactly pure when I watch certain sporting or entertainment events. Sometimes falls or slip-ups can be hilarious. It's human nature to find it a little funny when someone face plants. During the Olympics, however, something changes. These athletes have been spending their entire lives working for these moments. When one of them falls or slips, it's not fun or entertaining to watch at all. It's downright devastating because more often than not, someone's dreams are being shattered right in front of your eyes. Unfortunately, Dutch gymnast, Dutch gymnast Epke Zonderland face-planted of the high bar in Rio this week, and my heart broke for him. Zonderland was coming into this Olympics as the reigning champion on the high bars for men's gymnastics and he was competing for another gold in the men's high bar final on Tuesday. This guy was expected to kill it. He has the super appropriate nickname "The Flying Dutchman" for his insane routines on the high bars. Unfortunately, Zonderland was making a very difficult transition on the bars during the final and his hands simply slipped right off the high bar. He took a hard fall onto his face and his hopes of defending his gold medal were completely eliminated. Luckily, like a true Olympian, Zonderland got right back up and finished his routine flawlessly, walking way with only a red mark on his head from hitting the bar. Unfortunately his slip cost him the gold medal and he finished seventh out of eight competitors. Epke isn't alone in this, though. Here are some of the other gnarliest slips and falls during the 2016 Olympics so far. This Olympian is a runner in the 3000m steeplechase. The athlete from Uganda took a hard fall over a barrier and actually slammed his head/face on it before he hit the ground. Did that stop him from finishing the race? Absolutely not. He got right up and kept going. An Olympic hurdler, he is likely aware of how common falls are in his chosen sport. Those hurdles are killers. The Haitian hurdler was running the 110m and crashed pretty hard into the first hurdle. His chances to qualify for the finals immediately came to an end but in true Olympic spirit, he got up and finished his race. This story is one for the history books. New Zealand runner, Hamblin and American runner, D'Agostino, were competing in the 5000m women's race when the two took a tumble over each other. Both of them hit the ground hard and instead of just getting up and running away, D'Agostino took Hamblin's hand to help her up and run with her. D'Agostino soon fell again due to an injury to her right knee, but Hamblin returned the favor, helping her run as well. The moment is everything about the Olympics that I love. 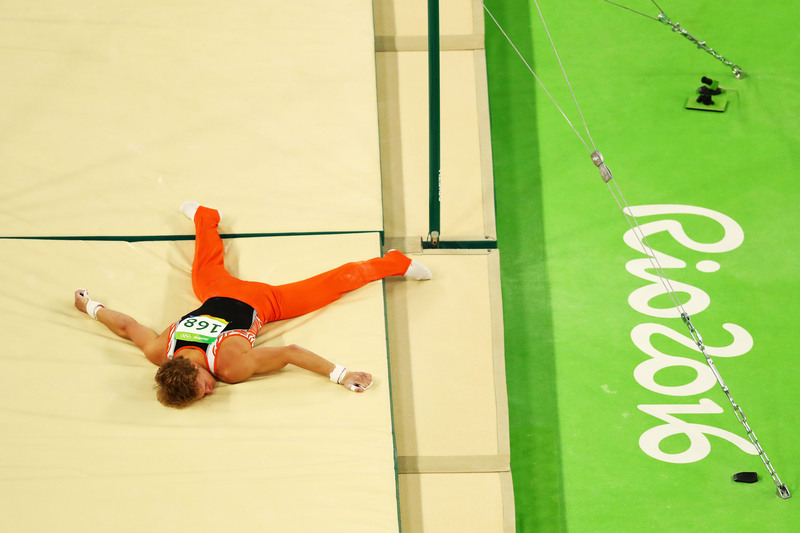 The Team USA gymnast had a similar slip to the Dutch gymnast when his hands simply slid from the high bar during a final. Unfortunately, the men's USA gymnastics team had a series of mishaps leading up to it, making the fall extra devastating. Great Britain's Elissa Downie had a really horrifying fall during her floor routine. The young gymnast legitimately fell on her head and looked at though she had really hurt her neck. Luckily, after leaving in a wheel chair, she was able to come back and finish her vaults to help her team. That's just a sampling of some of the tumbles that have occurred throughout the 2016 Olympic games. If anything, it shows what true athletes these men and women are that they can get back up and fight.